I cannot explain to you just how excited I am to put my Christmas tree up this year, albeit a little nervous with a toddler and a kitten, i'm sure it won't be up for long! If your one of those people who puts your tree up before December, I envy you, Dan would have me both put it up and take it down on Christmas day if he could get away with it, so our compromise is that it's allowed up from December 1st. My second favourite thing to Christmas is beauty products, I have far more than I am able to use but that that doesn't stop me lusting after more and what could be better than beauty filled festive treats, on your tree and your table?! 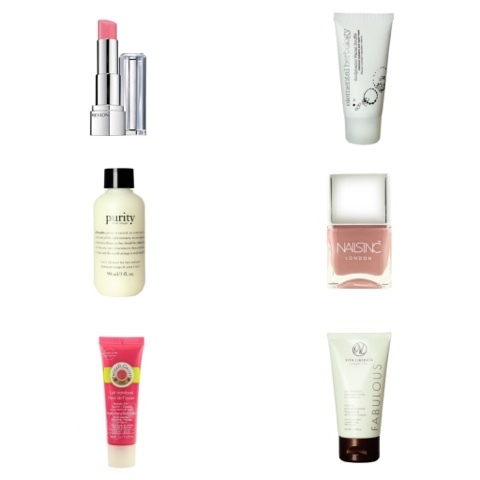 I have always loved the idea of Christmas beauty crackers and baubles as they usually contain miniature versions of cult beauty products, which allows you to try out some more expensive products for a fraction of the price, they also make the sweetest gifts and are usually within budget for secret santa gifts too! By Terry is one of those luxury brands that I have always lusted after, so many bloggers seem to rave about this brand with some of their most popular products being their Ombre Blackstar Eyeshadow Sticks and their Baume De Rose Multi-Protective Lip Balm but I could never justify the price of some of their products. However I would be seriously happy to find the Impearlious Baume De Rose hanging on my Christmas tree this year! This festive take on the original is what beauty dreams are made of! The Oskia Merry & Bright Christmas cracker from Space NK has to be one of my favourite picks of this post, I have always wanted to try this cult cleanser but at £29.50 for 100ml its not a price I want to gamble with, especially as skincare isn't a one-size-fits-all kind of product, however this cracker miniature is just £18.50 for 40ml which seems far more reasonable so i'm hoping this one will make it's way into my stocking this year! Do you have any beauty baubles ready to decorate your tree with? or beauty crackers to gift on Christmas day? I've lusted after so many beauty advent calenders for the past few years but I can never seem to justify the prices. However with Black Friday bringing us so many amazing deals, I have literally been hooked to my inbox over the past week so when I spotted that Latest in Beauty had 30% off, it gave me an idea to create my own beauty advent Calender! Latest in Beauty have recently relaunched and now offer a subscription box with a choice of 3, 6 or 9 products that you choose yourself, this means that you can choose products that you know you'll use, check the sample sizes and choose the colours/scents to suit you, however you can also choose to have these boxes as a one-off and you can buy multiple boxes too. I decided to purchase two boxes, a box of 9 products (£18) and a box of 3 products (£9) to make a twelve days of Christmas Beauty advent Calender that I know I'll love. If your quick enough and order this Cyber weekend there's 30% off EVERYTHING with the code 'CYBER' (ends Tuesday 29th November 16) which means that you can get 12 products for your D.I.Y Beauty Advent Calender for just £18.90 plus delivery (£3.95) instead of the usual price of £27 when following what I did. 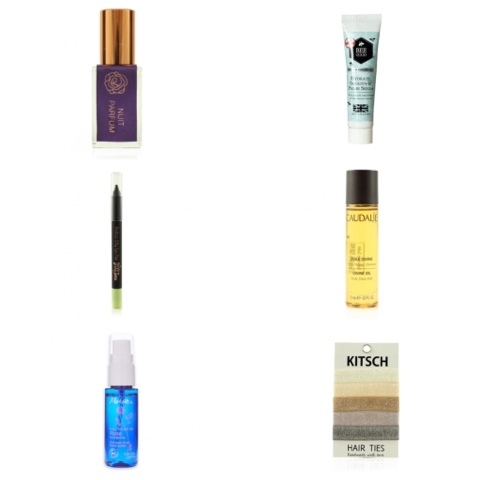 These are of course all subject to availability, I already missed out on the Alpha H Liquid Gold (sobs) so if theres something you really want, be sure to place your order sooneer rather than later top avoid missing out on a product like me. 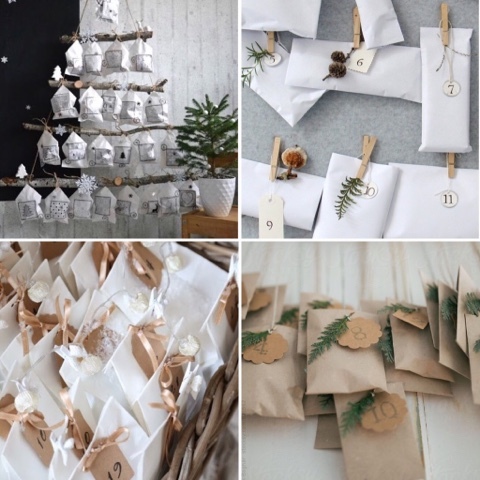 I have a few ideas from Pinterest on how to create my Beauty Advent Calender, from simply placing them in paper bags (£3.50 Ebay) with pegs (£1.65 Ebay) maybe in a basket (£6 Ikea) and numbering them with gift tags (£2.35 Ebay) to hanging them from a wooden tree ladder (£10 John Lewis) which means that you can make it cheaper or a little more expensive depending on your budget. I already have the pegs and wicker basket so if I go for thar option I only need to buy the bags and tags which means my whole Calender comes to a total of £28.70 including delivery! Though I am tempted by the wooden ladder tree that's for sure! I am seriously so excited to put this together and will update this post with a picture when it arrives and is complete! Be sure to check my Instagram here for updates too! 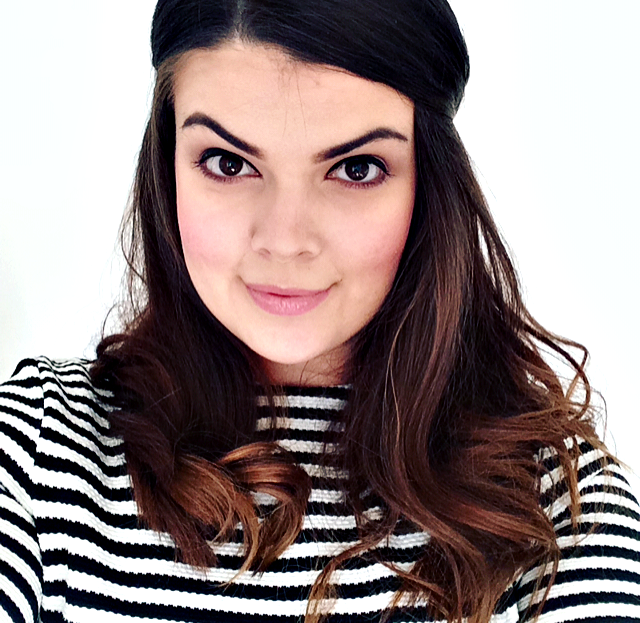 Will you be making your own Beauty Advent Calender this year? 1.Eat at the table with them - this probably sounds simple to some, I've been brought up to sit at the table when eating meals but Dan's family are the opposite and only eat at the table for Christmas dinner and we very quickly got into a habit of eating on the sofa and/or floor when moving into our own house. Since buying a new kitchen table, we have been eating every meal sat together and I find that watching us eat encourages Emme to eat more too. 2.Involve them in cooking - I've found that Emme seems to be encouraged by food when I involve her in the cooking, obviously shes too young to really be involved but simply doing things like letting her stir ingredients gets her more excited about her food. 3.Cook hearty home cooked meals - Emme gets much more excited about the home cooked flavoursome meals that I cook such as cottage pie, spaghetti bolognaise and chilli's, she will quite happily eat a bowl full of my homemade chilli and rice in the evenings but when I make her snacky bits for lunch such as ham, cucumber, cheese etc she merely picks at it and is very quickly done. 4.Mix it up - I often get stuck in a rut of giving Emme sandwiches for lunch but understandably she gets bored quickly so I have to remember to mix it up sometimes, even if its just doing something as simple as tuna pasta for lunch, it's still quick and easy but because I don't make it often, she seems to enjoy it more. 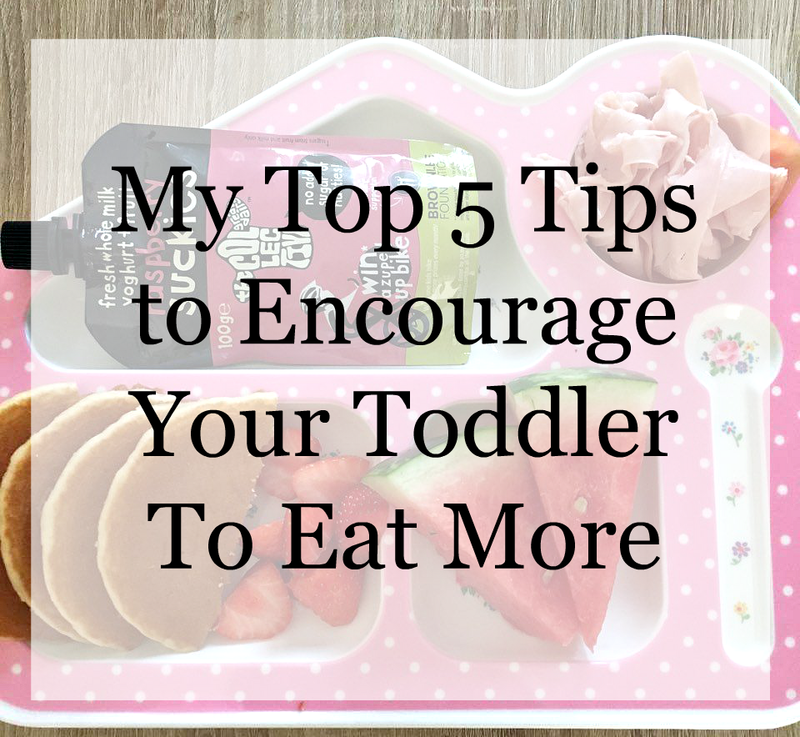 5.Cut down on the snacks - After a little research, I have found that two snacks a day is plenty for a toddler, we find that one in between each meal works well. Once Emme started walking, she just didn't have time for food, she was far too excited to explore that sitting in a highchair became a problem for a little while and she ended up snacking far too much! For me I was just trying to make sure she was actually eating something but it very quickly became a bad habit that we had to break. Since cutting her snacks down, I have found that she will eat more at meal times so it does seem to be working. 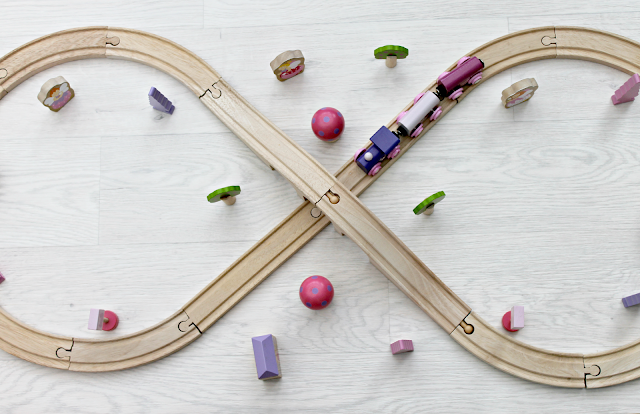 Do you have a fussy toddler? What are your top tips for encouraging your toddler to eat more? Becoming a mum means you really do learn to appreciate the simpler things in life, gone are the days when a shopping spree and a bottle of wine put a smile on my face, ok, the wine still puts a smile on my face but now after a long day, nothing makes me happier than a face mask and a bar of chocolate whilst binging on Netflix so when Facetox contacted me and asked me to review their 7 mask supply* I couldn't say no, with many celebs including Charlotte from Geordie Shore and Lydia Bright from Towie having shared their love for the face mask, I knew it had to be pretty amazing! My skin has always been troublesome, I've always had spots and more recently adult acne which means that choosing the right face mask is really important for me. Although I've always loved skincare, I have to admit, I don't often stick to a routine and I don't always remember to take my makeup off before I go to sleep which wreaks havoc on my skin so I rely on face masks to give me a helping hand and Facetox has been my saviour! 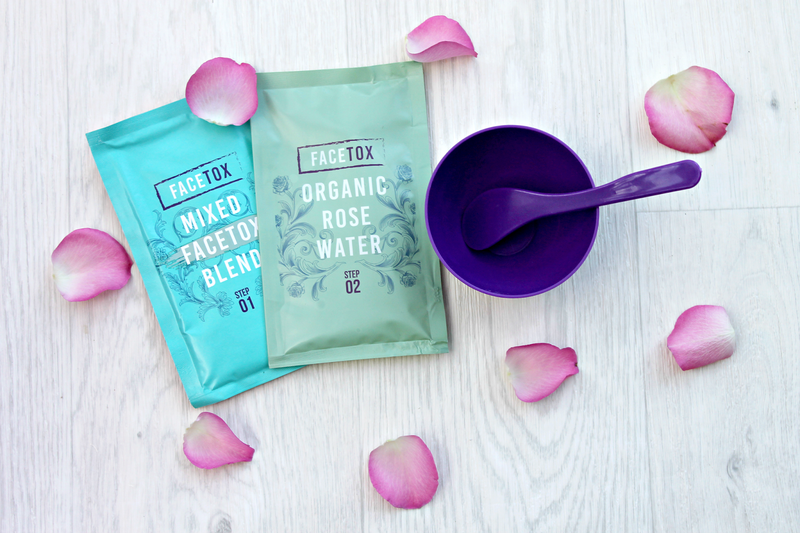 Available as a 7, 14 or 21 day treatment, Facetox is an organic, cruelty free, vegan face mask which extracts, pulls and detoxifies your skin. The face mask comes in two seperate sachets, one containing rose water, the other a unique blend of clay that causes a negative charge when mixed together and literally pulls the toxins out of your skin! It also helps to draw out blackheads, reduce the appearance of scars, even skin tone and shrink pores. I love mixing the face mask together, its feels extremely satisfying and adds to the experience of your pamper night. It's very important for the face mask not to come in contact with metal so you are provided with a plastic bowl and spoon. 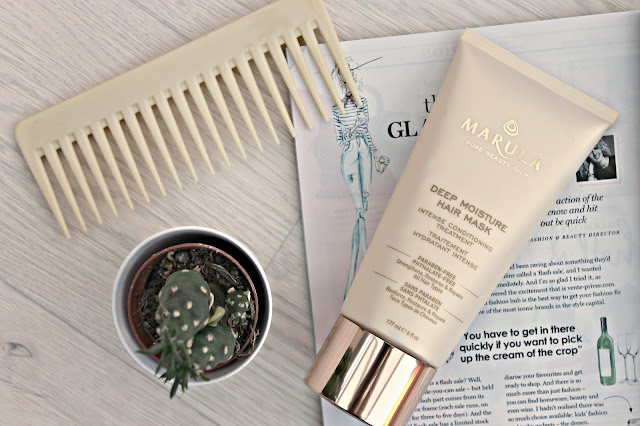 As you mix the blend together, the face mask becomes very thick, you then simply apply the mask to a clean dry face avoiding your eyes and mouth, allow to dry for around 20-30 minutes, wipe off with warm water and a face cloth or a Facetox Konjac Sponge and apply your usual moisturiser. Rinsing the mask off gets extremely messy so I usually apply this and if i'm having a serious pamper night i'll apply a hair mask too before settling down with a hot chocolate whilst the mask does its magic. I love that you can literally feel the mask working, it causes a slight tingling sensation as the toxins are drawn to the surface, as I know that the product is doing its thing. I'll then rinse it off in the shower which makes clearing up far easier. I have never used a face mask that has shown immediate results before using Facetox, it's normal for redness to appear and I did experience this after each use (this should subside within 30-45 minutes) but I was amazed at how bright, soft and clear this made my skin from the very first application and these results only continued to improve, with my spots gradually improving with each use. I have now come to the end of my supply and my spots have completely cleared up, Facetox has not only treated my spots but it has prevented them from coming back too. 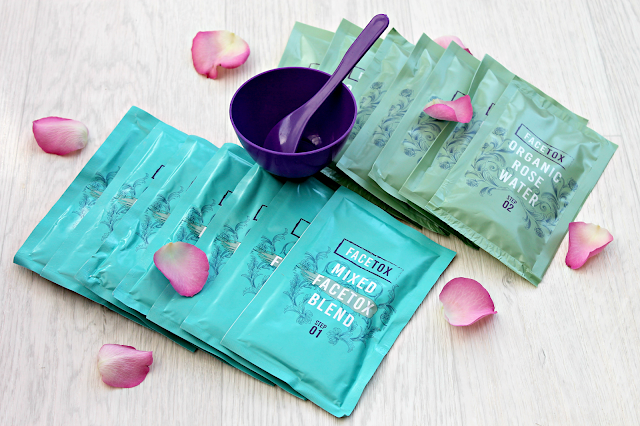 Facetox is suitable for all skin types but because it is such a strong treatment, it is recommended that you start off by using the mask 1-2 times per week for 15-20 minutes until your skin adjusts, you can then up this to 3-4 times per week for up to 30 minutes but I would not recommend using it any longer as it can start to become a little uncomfortable as it dries. 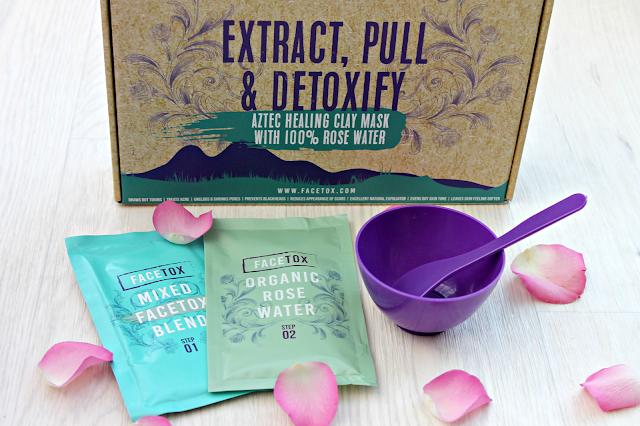 What I love most about Facetox is that due to the product containing only natural ingredients, it can be used safely during pregnancy so pregnant mamas can still have a pamper evening without the unnecessary worry! I would highly recommend Facetox to anyone in need of a skin detox! The 7 mask supply can be purchased here for £24.99 with worldwide shipping available. Have you tried Facetox yet?